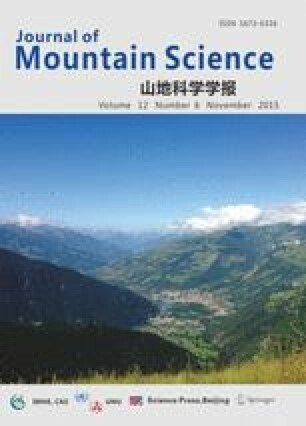 Zonation patterns of riparian vegetation have been sampled and described in mountain streams in two catchments in the Hottentots-Holland Mountains, Western Cape, South Africa. Six main vegetation types that differ in structure and species composition, are dominant along these river banks: Aquatic vegetation, Wetbanks, Palmiet, Scrub, Forest and Shrubland (Fynbos). The study aims to correlate the vegetation patterns to flooding patterns, in particular the inundation frequency and stream power. A problem arises: because these catchments are ungauged, like most mountain catchments, with the only weirs at the downstream end of the catchment. Discharge data at the weirs are extrapolated to the sites upstream by multiplication with a factor based on the size of the subcatchment that drains through a sample site. In this way, recurrence intervals for floods in mountain streams are derived. Discharges at sites are also calculated using bed roughness (Manning’s n) and slope in straight sections with uniform flow conditions. Stream power is derived from the discharges calculated in this manner. The combination of stream power and recurrence intervals explains the occurrence of most vegetation types occurring on the banks, except for one type: Afromontane Forest. This type is probably more dependent on other factors, such as protection from fire and the depth of the groundwater table.